Because who wouldn’t want to get fit for free?! Whether you want to join a free bootcamp class on the beach, or work on your strength training at Dubai’s free Calisthenics Park, here are 5 great spots in Dubai where you can work out – without spending a dirham! 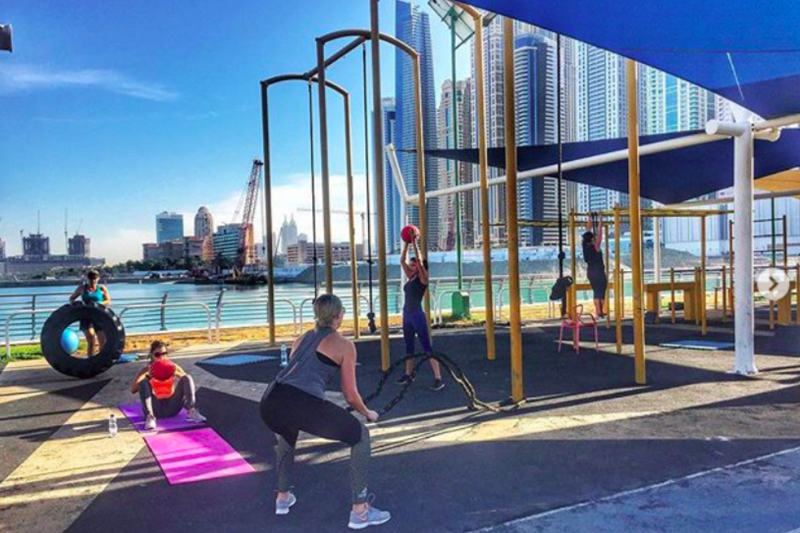 This open-air gym is an awesome place to train, and hang out with Dubai’s growing fitness community. They’ve got everything from pull-up bars and running tracks to open spaces for mat workouts. Fancy trying out a free yoga class? Yalla Yoga holds free evening yoga classes at the Calisthenics Park – check out the event page here. Many parks in Dubai have a variety of fitness equipment set up, and is free for anyone who wants to use them! Check out Al Barsha Pond Park, they’ve got gym equipment spread out across the park, basketball courts, monkey bars, a running and cycling track and more! Looking to get in shape, fast? Project DXB holds free bootcamps on the beach every month, and everyone is invited to join! The workouts are totally free to attend, but registration is required. Sign up here. Want to work on your flexibility and strength? Every Wednesday, everyone (including beginners and experienced yogis) is invited to lululemon for a free in-store yoga class! Mats are provided at the store, however make sure to get there early as it’s first come first serve. Read more: Looking for more fun outdoor workouts in Dubai? Check out out Fitness category for more inspo.